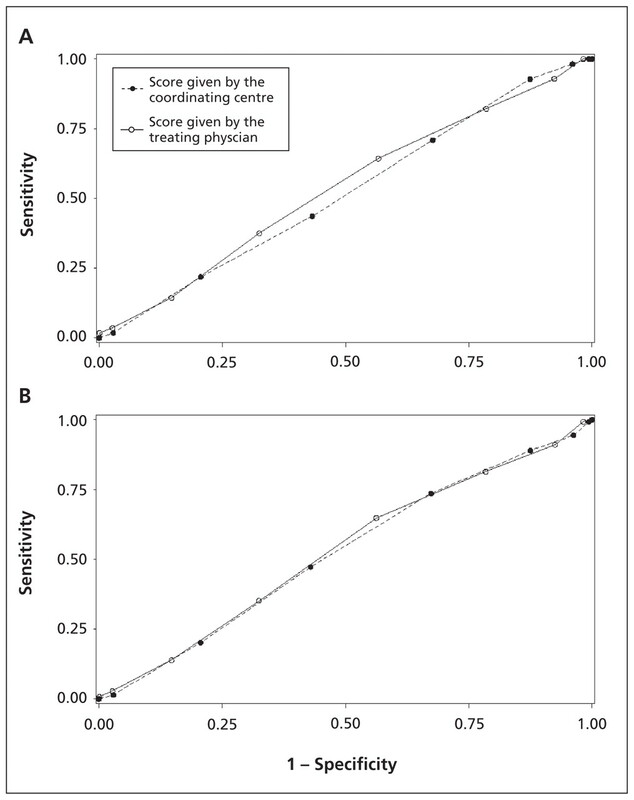 Receiver operator characteristic curves comparing the sensitivity and specificity of the ABCD2 scores calculated by the coordinating centre versus the scores calculated by the treating physician for predicting stroke. (A) Comparison of scores calculated by the coordinating centre (area under the curve [AUC] 0.65 [95% confidence interval (CI) 0.58–0.73]) and by the treating physician (AUC 0.56 [95%CI 0.47–0.65]) for predicting stroke at 7 days. (B) Comparison of scores calculated by the coordinating centre (AUC 0.65 [95% CI 0.59–0.70]) and by the treating physician (AUC 0.60 [95% CI 0.54–0.67]) for predicting stroke at 90 days. Receiver operator characteristic curve comparing sensitivity and specificity of the ABCD2 scores calculated by the coordinating centre versus the scores calculated by the treating physician for predicting recurrent transient ischemic attack. 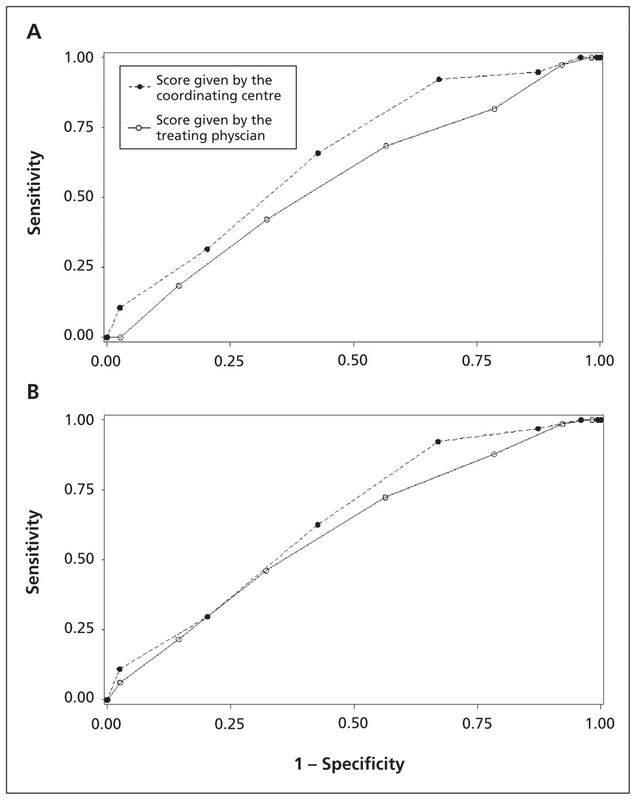 (A) Comparison of scores calculated by the coordinating centre (area under the curve [AUC] 0.52 [95% confidence interval (CI) 0.45–0.59]) and by the treating physician (AUC 0.54 [95%CI 0.46–0.61]) for predicting recurrent attack at 7 days. (B) Comparison of scores calculated by the coordinating centre (AUC 0.52 [95% CI 0.48–0.57]) and by the treating physician (AUC 0.53 [95% CI 0.484–0.58]) for predicting recurrent attack at 90 days. Response to Letter Regarding Article, "A Prospective Cohort Study of Patients With Transient Ischemic Attack to Identify High-Risk Clinical Characteristics"